The iconic Paris cathedral, which survived two World Wars, has apparently burned tot the ground today. Pics and vids are all over most news sites. Very bad day for the City of Light. I saw the news this morning, and felt very sad. I've been to Notre Dame Cathedral many times, when I was stationed in Southern Belgium, it was only about 45 minutes to an hour away from my house. I've been to a lot of European Cathedrals, and Notre Dame was one of my favorites. These ancient structures are awe inspiring, every stone block was hand cut and fitted, and every piece of stained glass was painstakingly pieced together. It looks like an awful lot of history is being destroyed by the fire. Inside are a huge number of ancient tapestries and oil paintings, as well as a century's old pipe organ. There are a tremendous amount of ancient stained glass windows, depicting Bible scenes, that undoubtedly are going to be destroyed as well. I get a sick feeling even thinking about how much antiquity is going up in smoke. Unbelievable. How does this happen? Ironically, there is talk that it may connect to the ongoing major renovation operations.. Too early to tell for sure. Man, this is very sad. I have also been there many times; the latest this past October. Eight hundred years of history destroyed in a few hours. It can be rebuilt, but never replaced. The view of the front square from the 'gargoyle' level. This is very sad indeed. I have been watching the news in shock for a few hours now... Incredible how so much history can be destroyed in such a short time. Awful. 850 years old. So sad. And during Holy Week no less! A friend of my daughter's was there just this morning to hear the choir. I'd been there years ago when stationed in Europe. Millions visit every year just to see Notre Dame's beauty. 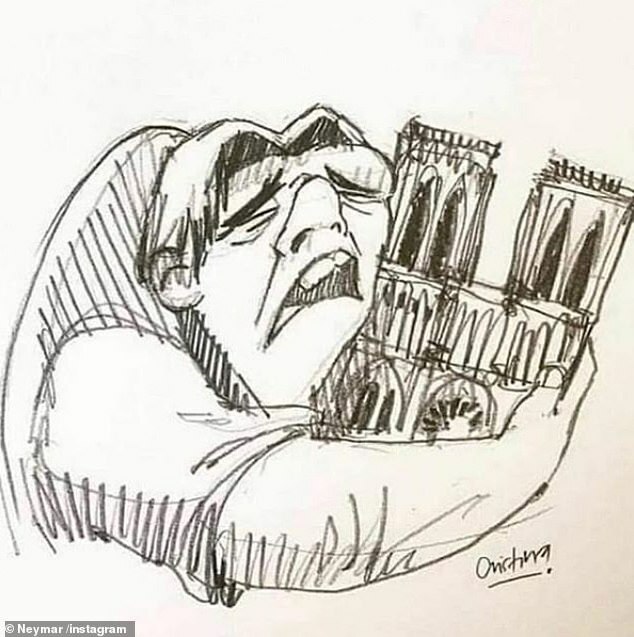 Aside from the loss to Catholics everywhere, the architectural and artistic losses are immeasurable. 850 year old timbers, coated in pitch as a preservative, burnt quickly. The lead on the roof, and the lead holding the glass in the windows together had to melt quickly as well. 400 firemen fought to contain this fire to no avail. The walls are now in danger of collapsing. Possibly the two bell towers can be saved. The only good news is that there are apparently no fatalities. They think that construction may have sparked the blaze. My heart goes out to the people of Paris, and France. To see nearly a millennium of history burn in just a few hours is a heartbreaker. For it to happen during Holy Week is even that much more devastating. Main hall and art apparently saved. No, sadly, it's gutted. I've seen aerial photos. They might be able to save the bell towers, but the main church itself is gone. Much of the art was saved, but the windows and paintings are gone. The huge organ is obviously gone, and no one knows what the damage to the tombs in the lower levels is. They're afraid that the walls will fall. So you're the Hunchback? Cool! This is just so sad. Such a strong symbol. As stated above, it can be rebuilt but not replaced. Not many things cause this sort of reaction in me--I burst into tears sitting at my deak when the news crawl worked its way across my screen. I hoped it was wrong. Irreplaceable beauty and significance. Heartbreaking. That picture is from 5 years ago. Back then, anyone that paid the (8?) Euros could climb the seemingly endless stairs to that level. Pretty neat walking around the outside of the cathedral at that height. Farther back (mid-90s), they had a bell tower tour (even more stairs) and let the group stand under the large one. A group of about 12-15 fit with room to spare. They had someone lightly tap the side of the bell with a pencil or a knuckle. LOUD!!!!!! So very sad. Also, in case you don't know, this place is very, very important in music history (the start of polyphony). So apparently, the towers are saved (with the bells), by the firefighters who concentrated on this. They need time to assess the sturdiness of the rest of the stone masonry, but that may be Ok, the whole carpentry and upper structures will have to be rebuilt, it will be done! Strange how we consider that kind of testimony from,the past as being eternal... We’re in Italy now and heard about the fire from the waiters at the restaurant, who told us when they heard we were French, everyone was shocked. Thankfully, the ceiling held back most of the fire damage from the main church. Much of the glass was saved, as were both organs. It could've been so much worse. It says a lot about 850 year old stone construction, and the dedication of 400 firemen. Already, over 600 million euros have been pledged for the reconstruction. They'll be hard pressed to find enough timber to redo the roof structure, tho. The original roof used over 30K acres of trees. VIDEO: Today inside: looks MUCH better than I expected! My wife has a long, fond affinity and connection with Paris...we set this Delacroix print out this morning. The mug is from her staying part of a Summer with old family neighbors early 70's. Her separate room in our home is nicknamed the "Paris" Room...with all the other books and pictures and such. It will be rebuilt. An amazing structure by any standard or culture. Catholicism saved and sustained by France changed the World Order in a lot of ways, and Notre Dame Cathedral is the Landmark of that success.